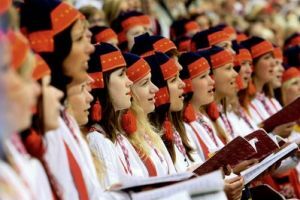 Singing is a tradition firmly rooted throughout Baltic culture, as evidenced by practices such as the Estonian Song Festival, begun in 1869 and initially promoted as a means of encouraging Estonian as the national language. Beginning in the 1940’s, however, Soviet occupation of the Baltics forbade patriotism through art and song, and public performances were heavily censored. While the Song Festival was allowed to continue under the strict Soviet eye, Estonians slipped a sense of nationalism through the censors by singing Communist-approved lyrics set to melodies handed down through generations of choral tradition, fostering a deep feeling of unity through the very act of collective singing itself. In 1947, Estonian conductor Gustav Ernesaks led a crowd of 28,000 singers and 100,000 audience members at the Song Festival in a rendition of the national anthem “Mu isamaa, mu õnn ja rõõm” (“My Fatherland, My Happiness and Joy”). The Soviet censors were so convinced of their own authority that they never realized the crowds were singing about Estonia, not the Soviet Union. As the Soviet grasp tightened around the Baltics, scores of artists and teachers were fired or deported to Siberia. Any new works of art had to be published in Russian and adhere to strict guidelines, with Soviet themes. 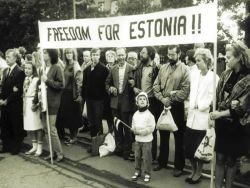 1987 brought mass protests in the form of Estonians gathering in Tallinn to sing national songs, marking the first year of the Singing Revolution. In June of 1988, participants of the annual Tallinn Old Town Festival in Estonia walked 2 ½ miles to the Song Festival grounds in a spontaneous demonstration of patriotic songs. 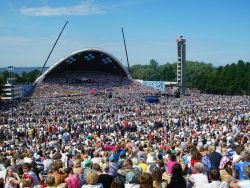 That September, the Song Festival attracted 300,000 Estonians, a third of the population, to attend and sing forbidden songs en masse as a unified statement of protest against Soviet rule. Even in the presence of Soviet dignitaries and the KGB, the crowd boldly sang of Estonian tradition and patriotism in a peaceful but powerful demonstration. On August 23rd, 1989, two million Estonians, Latvians, and Lithuanians joined hands to form an unbroken chain over 370 miles from Tallinn through Riga, Latvia, and Vilnius, Lithuania, in a protest known as “The Baltic Way”. The Singing Revolution had set the ball rolling for the Soviet Republics, and between March and May of 1990, the three Baltic states of Estonia, Latvia, and Lithuania were the first to declare their independence from the Soviet Union.